Amahoro House: An opportunity for deep connection in each moment. I saw her in the shelter a few days before the following conversation took place. She had a flower in her hair and I remember thinking how much she really was like a flower. When she allowed herself to smile, to really smile, it was as if a tight bud was bursting into bloom. We exchanged a hug that night and I went about what I was doing. The conversation took place a few days later while meeting with the shelter director. We were meeting to go over our presentation at this year’s National Healthcare for the Homeless symposium. I had been aware that this shelter guest had been hospitalized twice since that brief hug early in the week. Hospitalized, on life support briefly, then discharged and re-hospitalized on life support again, finally discharged a second time. It hadn’t sounded optimal. She started the conversation by sharing her time at the woman’s bedside just before her second hospital discharge. A nurse had come into the room and engaged the woman; chastising her in a way that might only be described as “shame based care.” It was a salient example of the very reason we were approaching this national audience. Our presentation would focus on “helpful being.” Illustrating ways to care for someone; who suffers from serious illness and chronically homelessness, which are driven out of deep compassion and awareness of our interconnectedness. In Africa we know this as “Ubuntu-I am because we are.” Our goal was to illuminate the possibilities in every encounter, to shine a light on the bud that can burst into a bloom with the right nourishment. As the conversation dissolved into the room an image floated through my mind of the importance of each encounter. Each encounter we enter into holds the potential for a type of reciprocity and deep connection. I imagined the partnership that emerges between a bee and flower bloom. The flower radiates the light of beauty and life. 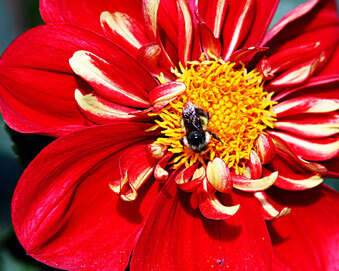 The bee, a marvelous being, pollinating flower blooms, equally holds the power to sting. I wondered how many more people would encounter this young woman and choose to nourish her instead of stinging her. I vowed to hug her the next time I saw her, nourishing her beauty and light. And I was grateful we would have a chance to take the podium and offer healthcare providers a new awareness of the opportunities each encounter holds. Ahaa, its pleasant conversation about this paragraph here at this webpage, I have read all that, so now me also commenting here. We all trying to get the amahoro house for having more opportunities. Then we will get deep connection in each moment with out borders and thanks for given everything in this blog.